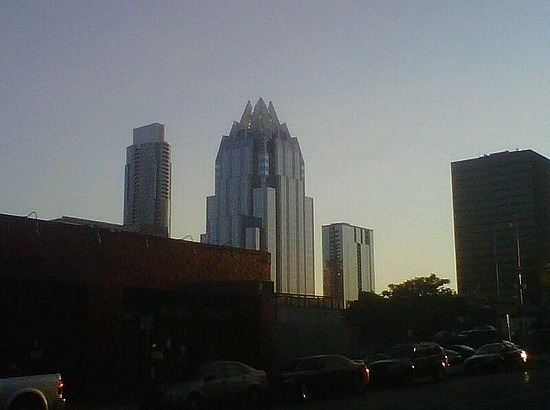 This weekend I signed up to climb to the top of the Frost Building to raise money for the American Lung Association. You would think that knowing I’d be climbing about 33 flights of stairs that I would train a little bit for it. Nope. Not me. I have let it go until the last minute and now I am going to just have to do it. I’m really nervous, but I’m going to make it no matter what!! I’m not sure why I thought I would be better off making something to eat rather than training this week, but I found this and it seemed easy enough. I got this recipe off Pinterest. I copied it exactly from the recipe on Martha Stewart’s website. The only major prep to this was making the cornbread, grilling the chicken and dicing some of the vegetables. Other than that, it was an easy recipe to make!! 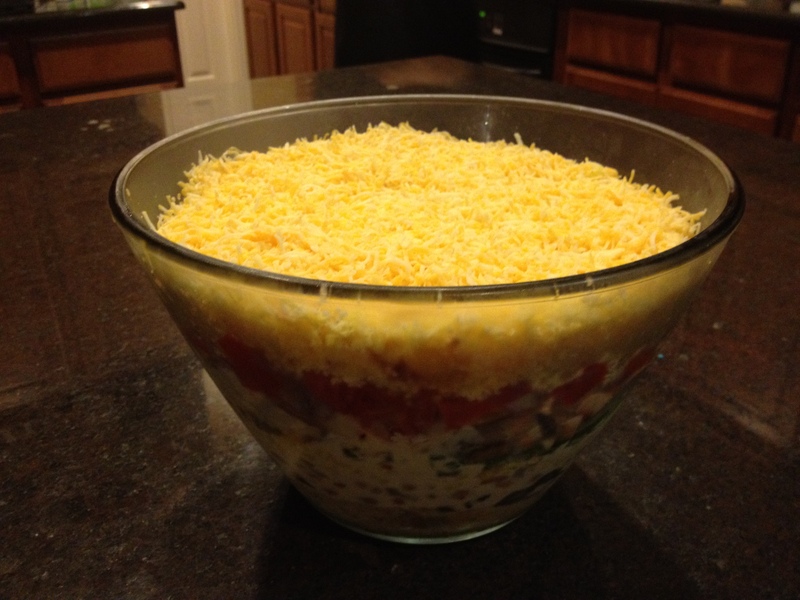 In large clear salad bowl or trifle dish, layer half of the cornbread followed by olives, pinto beans and corn. Top with 1/2 cup of the dressing. 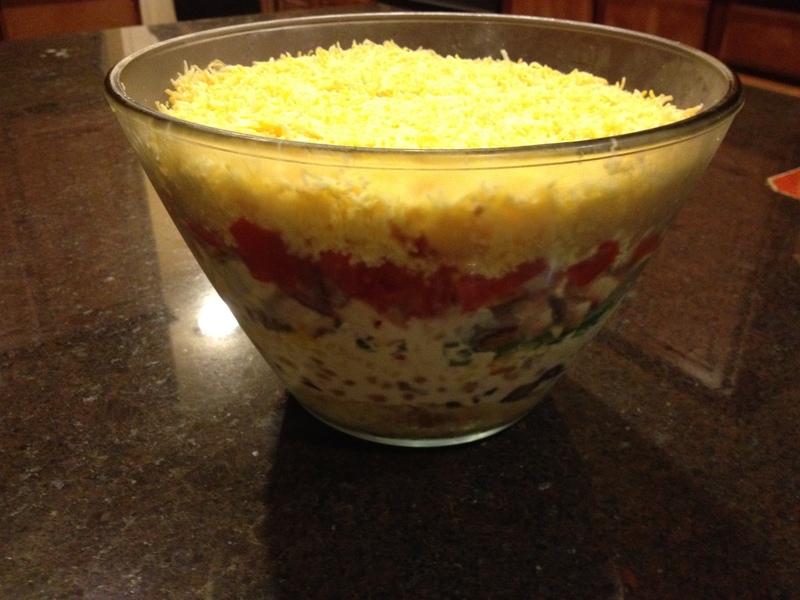 Layer with bell pepper, chicken, onion, tomatoes, remaining cornbread and remaining dressing. Sprinkle with cheese. 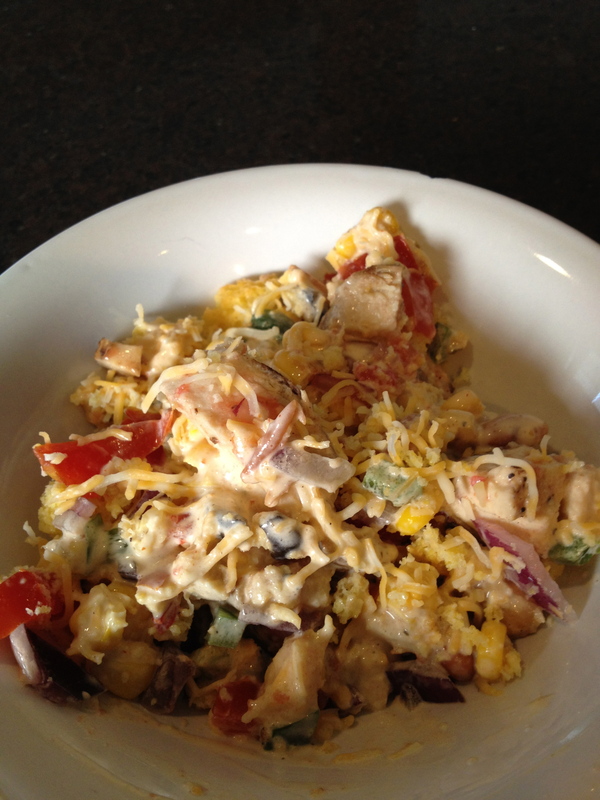 Cook’s Note:*Make without the chicken for a great side salad. I really can’t lie though. The only thing I actually made myself was the cornbread. Mike ended up making this recipe because our propane went out on the day I wanted to make it. By the time we were able to cook the chicken, I had lost interest in making it myself.